With all of the rich, heavy food we tend to eat over the holiday season, I always start to crave salads or something green and light! I guess it is the body’s attempt to find some balance, thankfully. Here is a salad I was craving the other day. I made it a few years ago as a first course and it was so delicious, that I actually remember it years later! The most stunning thing about the salad is the roasted grapes. I had never heard of roasting grapes before, but what a revolution! The roasting brings the forward the sweetness so much so that the grapes literally burst with it – a little like ice wine contained within the skin of a grape! The other ingredients all balance the sweetness of the grapes: the prosciutto brings a lovely saltiness; the tart cherries lend a tang and some chewiness; the pears are fresh and the walnuts are rich and crunchy. All work together to create a very memorable salad! I found the recipe in a Bon Appétit magazine a number of years ago and have tweaked it. The original recipe called for Pecorino Romano cheese which adds yet another dimension to the salad. I prefer a nice creamy cheese, such as Cambozola pictured here, but you may prefer a bolder one such as the Pecorino Romano. This salad would make a nice side to the French Canadian Tourtière I posted last week. I hope you enjoy it! Preheat oven to 350°F. Toss grapes with ½ tablespoon olive oil and place on a parchment lined baking sheet. Roast until the grapes begin to shrivel, about 15 minutes. Remove from oven and allow to cool. Add 1 tablespoon olive oil to a skillet and heat over medium heat. Add the prosciutto and sauté until crisp. Remove from pan and drain on paper towels. Place cherries in a small bowl and cover with hot water. Soak for about 15 minutes until the cherries are soft. Drain and pat dry with paper towels. Whisk together the ingredients for the salad dressing and put aside until serving time. 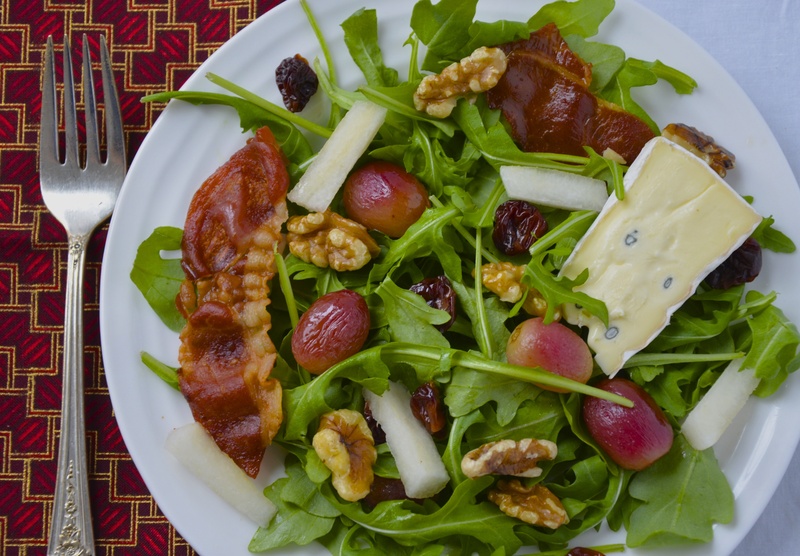 To assemble salad, toss greens with the grapes, cherries and pears. Divide among plates. Drizzle with some salad dressing. Garnish with pieces of prosciutto, walnuts and a piece of cheese. This salad can be eaten as a meal with some hearty bread or as a side dish. Yes, it’s a keeper! Hope you get to try it out! Thanks so much for stopping by ! I’ve never cooked prosciutto before but this looks like it gives it a great texture. Yes, I had never cooked it before this recipe either, but trust me, it is addictive! I couldn’t stop myself from eating it…lucky I had a few pieces left over for the pictures 🙂 Thanks for taking the time to comment, btw. Cheers! This is absolutely gorgeous, and such great ingredients! Anything with proscuitto or arugula has me hooked! I agree with you that a creamy cheese would be better than a hard cheese here. I can’t wait to try roasted grapes! Yes, you really should try the roasted grapes! They are such a treat and so unusual. Thanks so much for the comments – I appreciate it!